Best-selling books aren’t usually discussed during our daily 15-minute customer service personnel briefings. 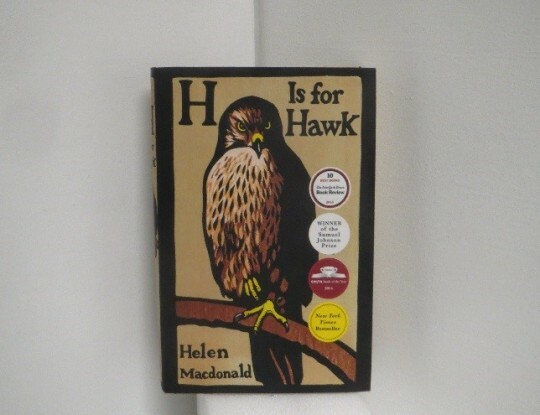 During a recent briefing focused on the museum’s extensive loan program, an old taxidermy mount in a new portable display case steered discussion to H Is for Hawk, the award winning 2014 non-fiction work by Helen Macdonald. “That’s a Goshawk?” exclaimed one staff member, pointing to the life-like preserved remains of a big gray and white raptor perched in a 28 inch high plexi-glass sided box. “The bird is huge!” She went on to explain that as part of a book club, she had been reading, if not always enjoying, H is for Hawk, which features a young Goshawk as pivotal character. As someone then halfway through the book I was able to affirm the narrative’s difficult passages and take advantage of the fleeting teachable moment. H Is for Hawk can be a tough read because it addresses grief and depression and the historically frequent misinterpretation of the lessons people should take from highly adapted predators. I pointed out that the stuffed bird that was in front of us presented several physical adaptations for the efficient capture and killing of prey. Whether you’ve read the book or not, you can gain a fuller appreciation for the physical attributes of birds of prey by closely examining the taxidermy mounts of hawks and owls currently on display at Carnegie Museum of Natural History’s interactive exhibition Discovery Basecamp, which is on the first floor of the museum.